And that is a good place to set out to really even attempt to dig into the riches of Georgia’s music. Most scholarship puts their polyphonic tradition as far back as we can estimate. Certainly the earliest Georgian Orthodox liturgy that we know of is polyphonic (many voiced, interweaving tunes). In all likelihood Georgian liturgy was polyphonic at least a millennium before Western Europe hit upon the same notion. And perhaps, though it is difficult to prove, there is even a connection between the two. I don’t think it’s merely a coincidence. The Christian philosophical underpinnings stress a triune God, who is interwoven in ways that are beyond human grasp. Polyphony, whether of Bach or of Sakartvelo, stresses these things. And polyphony may be the closest means of understanding such a concept that humanity has ever discovered. But it isn’t simply Georgia’s religious, hence classical, tradition that shows the complexities of polyphony. It is indeed found in the work chants up in the mountains. It is found in the simplest of everyday ballads, wherever two or three are are gathered. But did I say simple ballads. Yes this music is very direct, shooting straight to the heart, but simple? Hardly. 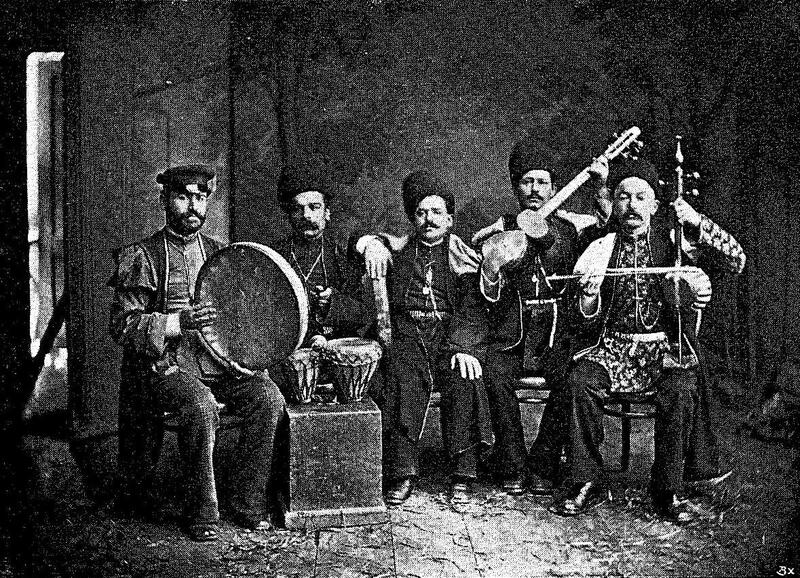 Georgian melodies have a basic major minor modality. If you hear their dance tunes you immediately notice commonalities with Russian and other Eastern European styles. A tune by itself might sound Greek or even Italian. And yet there are real differences. There will also be something else as well. A serious touch of the Middle East with it’s bittersweet melodies. But unlike the music of Syria, Lebanon, Egypt and the entire Arab World there are harmonies. And it is in these harmonies that the secret of Georgian music begins to reveal itself. There is definitely a connection to the music of Armenia, also a lone Christian neighbor in a sea of Islamic musicality. And yet to these ears Armenian music has much more in common with the Middle East, except for its liturgy. 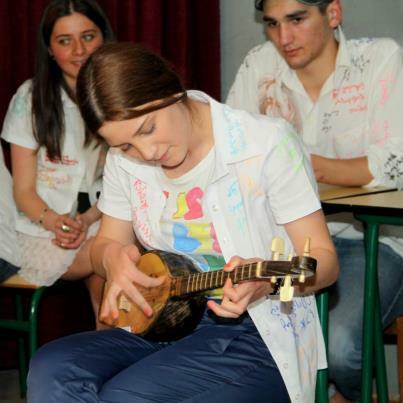 But Armenia and Georgia share a few instruments like the duduk, a haunting reed instrument played more for contemplation in Armenia and more rhythmically in Georgia. But Georgian music is a world apart. When musicologists first began to pay attention to Georgia in the 19th Century they were really baffled. Music from other corners of the world seemed much more comprehensible. Pentatonic scales, blue notes, microtones all seemed a lot easier to classify than what was going on in the more European Georgia. So here were major and minor scales, some Middle Eastern modalities and then something else again, a startling dissonance which might suddenly raise its head from seemingly nowhere. But unlike the dissonant music of the early Modernist era, there seemed to be a real code to how this dissonance was added in order to also preserve tonality. Igor Stravinsky in an interview late in his life was asked what music was important to him. He answered, “One of my greatest impressions, is of a recording of Georgian polyphonic folk singing from mountain villages near Tbilisi. This tradition of active musical performance, which goes back to antiquity, is a wonderful treasure that can give more for performance than all the attainments of new music.” And he was referring to Modernist classical music. 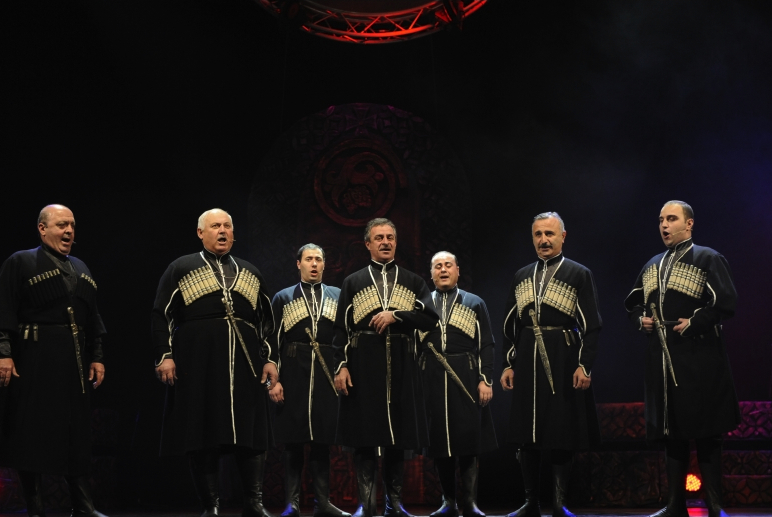 Choirs like the famous Rustavi Ensemble or the Gori Women demonstrate both the earthy and unearthly sounds of the Georgian voice in a disciplined setting. On the album Archaica the Gori Women sing at moments of such vocal dissonance to make even György Ligeti blush. You can immediately understand why Stravinsky was so entranced. And yet the overall feeling of the Gori Women’s Choir is not of dissonance but of rich harmonic beauty. There are also great recordings of the wilder untamed forms of vocal music found back in the mountain villages. What has also been attracting my attention lately is the modern dance music of Georgia based on traditional themes. One recording I stumbled upon is called Georgian Dance Music by Chabuka Amiranashvili (ჭაბუკა ამირანაშვილი). If a person loved the music of say The Ukrainians or of Gogol Bordello I would point them very firmly in this direction. I can’t explain it except to say it starts off like some sort Eastern European melody played by manic double accordions and then suddenly a modern bass kicks in followed by wild Middle Eastern percussion which then carouses between tunes jump started from inside one another. Positively addictive. And, as I found out later, these tunes are mostly eminent folk instrumentals that everybody knows and more importantly knows the dance steps for. Latin American cultures keep their dancing very much alive too. But these are often contemporary dances: salsa, merengue, etc. 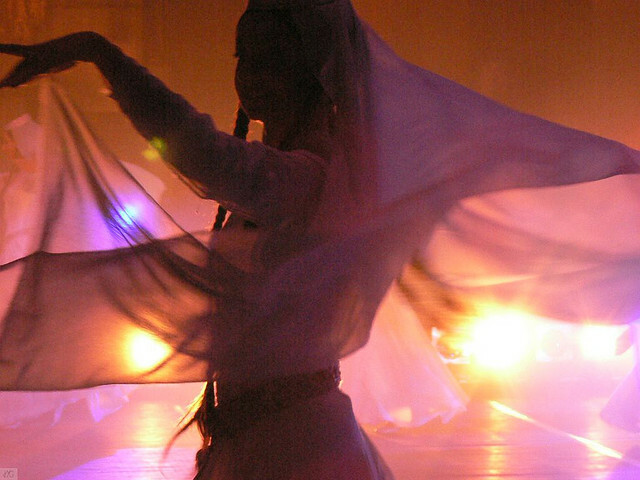 Georgians are keeping dances alive that in many cases are hundreds of years old, if not much more ancient. They are using their bodies to keep alive the memories of their culture. And though naturally they are exposed to the same barrage of pop culture as the rest of us, and while they might even occasionally attempt a bit of imitation of what is seen on videos, they do not do it at the expense of their traditions. Because they know that once they stop singing and dancing they will basically cease to be Georgians. 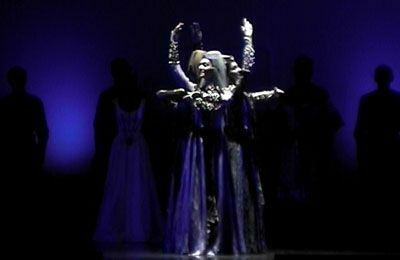 And when they decided to put together a show, as the group Erisioni (ერისიონი) did in 2000, when they traveled to France and beyond to perform with a large contingent singers, musicians and dancers to perform in large auditoriums what essentially was a highly polished version of what every Georgian knows by heart, jaws dropped with mathematical regularity. Women floated across the stage in some of the most beautiful traditional clothing imaginable, the men’s choir hit with volley of sounds unknown in the West, young boys beat the time on the doli, duduk players raced in a bewildering competition, the girls pranced and the men jumped higher than horses and landed on their knees and toes only to spin up and do it again and the profound joy of Georgian culture left the onlookers speechless and celebratory. And yet back at home teenaged girls still sang together in the backs of vans. Or in houses. Or on the steps of an apartment building. One girl, Ani Chincharauli, is given a microphone at a special event. She strums the panduri, a three string lute like instrument with roots back to ancient Sumeria. As she plays she is seemingly ignored by everyone… until the moment her clarion voice starts to sing. But I’m convinced, as startling a voice as she has, that Gavin Bryars is right. The distinctions between amateur and professional are almost non-existent here. It isn’t the voice that is really the signal for joy. It is the song itself. It is the fact that everyone knows it. It is the fact that the poetry of the language still resonates in a way in which poetry no longer does in the virtual world of the quotidian workaday technophages we have all become out here in the tame nowhere. The Georgians are not singing to be heard by us. They are still singing and dancing for each other. Ani Chincharauli plays the panduri before she begins singing. It’s a simple moment among friends. Just trust me and buy Chabuka Amiranashvili’s Georgian Dance Music after you sample it a bit. The Gori’s Women’s Choir can still be found inexpensively. Erisioni has a full length DVD of there Georgian Legend and you can also find a small version of it here. But I say just go buy it!! And finally one last simple Ani Chincharauli song.